Exhaust ventilation systems installed in high-rise buildings and premises.For buildings with mono-pipe ventilation system.For mounting in kitchens and bathrooms.Flush wall or ceiling mounting. The fan consists of the fireproof casing BF for flush mounting and exhaust ventilation unit Valeo with a flat front panel. Two- or three-speed motor with centrifugal impeller. Minimum energy demand.Galvanized steel impeller with forward curved blades.Automatic maintaining of constant air flow depending on variable air resistance of the duct.Balanced impeller ensures low-noise operation.Best aerodynamic characteristics due to special scroll casing design.Ball bearings provide long service life.The ventilation unit with motor is fixed inside the casing with special latches. Installed in wall or ceiling during general construction works by mounting brackets supplied as a standard.Connection to main ventilation shaft with flexible air ducts.Exhaust spigot diameter 80 mm.Power is supplied to the fan through a sealed electric lead-in on the casing.After installation works cover the unit with a protecting cover to prevent dirt ingress.After finishing works install the ventilation unit inside the casing and connect it to wiring system. The mechanical centralized mono-pipe exhaust ventilation system for kitchens and bathrooms based on Valeo-BF fans in fireproof casing with fire-retarding damper is specially designed for high-rise residential premises with high fire safety requirements. The inter-floor fire dampers are installed in the ventilation shaft to prevent fire and smoke extension in case of fire.Fresh air is supplied to bedrooms, children's room or living rooms through window or wall vents. Vent modifications with air volume regulation are available. 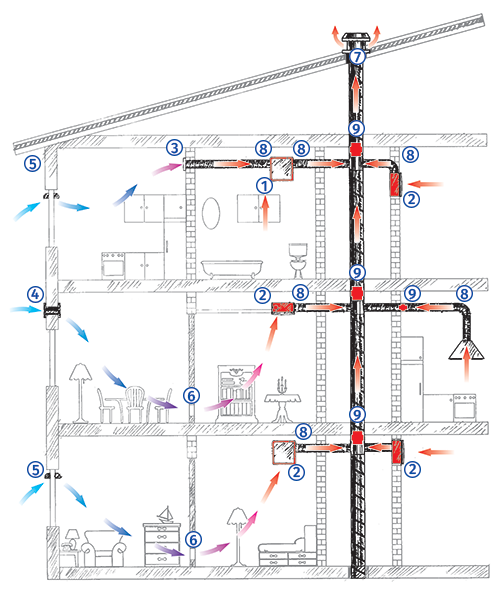 Stale air is extracted by exhaust fans from the room through inside doors or door grilles in the kitchen, bathroom or WC.This ventilation system arrangement ensures non-stop controllable air circulation in the room, comfortable microclimate and high fire safety. 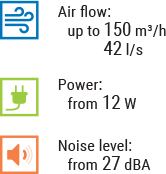 1 – Exhaust fan Valeo-BFD with extra spigot for room-to-room ventilation.2 – Exhaust fan Valeo-BF.3 – BLAUBERG wall grille, DECOR series.4 – BLAUBERG wall vent, WMH series.5 – BLAUBERG window vent, FHM series.6 – BLAUBERG ventilation door grilles, DECOR series.7 – Central ventilation shaft.8 – Flexible thermal-resistant air ducts for connection of exhaust fans to the central ventilation shaft.9 – Inter-floor fire damper.